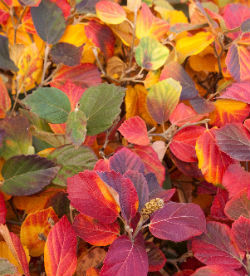 5 Best Fall Beauties | Faddegon's Nursery, Inc.
Fall definitely feels different with some blazing colors and berries in your landscape. Color brightens your mood and lends vibrance to the season. Here are our picks for easy landscape color that will take you into winter with a better outlook. All hydrangeas are stunning whether they’re just opening or long since done blooming. Colors include the softest white and ivory, beautiful parchment browns, blues, pinks, reds, greens and mauves. Take your pick! One of our favorites is ‘Pinky Winky’ with its strong stemmed, rigidly upright bloom that is bigger, pinker, and far less floppy than ‘Pink Diamond’.Its long lasting flowers will be a late summer treat you’ll look forward to and enjoy well into the fall. Flowers emerge in late July and persist endlessly until you cut them to bring inside for the winter as a dried bloom. 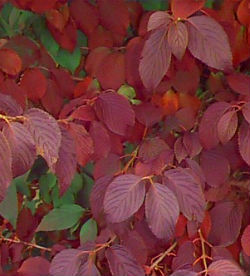 Three season interest is what Fothergilla is all about. Dense with showy and fragrant (honey scent) white flowers in spring, ‘Mount Airy’ has blue-green summer foliage and then ends the show with shades of yellow, orange, red and purple in autumn. This particular cultivar has really been around the block, and is considered to be the best of the species. It comes originally from the Mount Airy Arboretum in Ohio via Michael Dirr, a well known plantsman. Fothergilla major requires very little of you, has no significant disease or insect issues and is a truly reliable native plant. Who can resist a plant with a name like ‘Sparkleberry’? 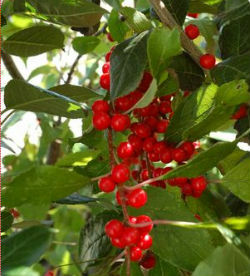 When this shrub sheds its leaves in fall, bright red berries present themselves in abundance and persist all winter. Not only will you possess a true winner in the autumn landscape, but plenty of stunning branches can be cut and brought indoors without detracting from your plant. For birdwatching, this shrub is a must. Over 40 species of wild birds consider winterberries to be the best thing on the menu in fall and winter. Cardinals, Cedar Waxwings and Northern Flickers will flock to get in on the prize! An Eastern North American native, ‘Sparkleberry’ is the best of the best when it comes to winter fall and winter interest. Berries are on female plants and will need a pollinator. 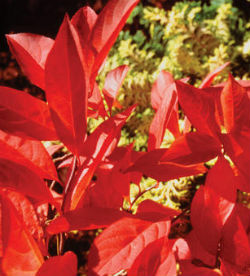 ‘Little Henry’ sports brilliant red foliage on a compact mounded form in the fall. If you’re looking for a small selection, ‘Little Henry’ fits neatly into the landscape. 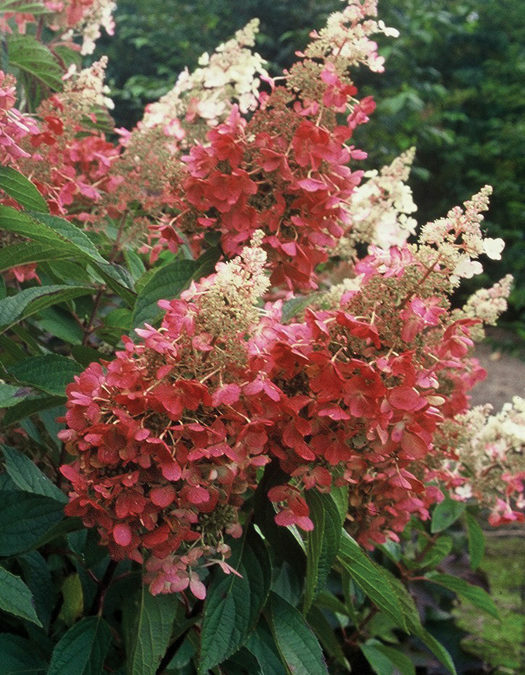 Sweetspire is also one of the handful of plants that are happy in sun or shade, although the bright fall color is better in full sun. Don’t pass it over for the shade though. You’ll still get a beautiful mix of reds and oranges in this little firecracker! Sweetspire likes moisture, even enjoying wet ground, but is very drought tolerant after establishment. Being a North American native, it’s more than able to deal with a demanding environment with ease. ‘Little Henry’ has fragrant white flowers in early summer making it a favorite for butterflies while deer leave it alone. Love deep, rich burgundy tones? Almost nothing has the same seasonal feel as a doublefile viburnum. Paired with plants in the orange range, you’ll get autumn visuals you will always love. 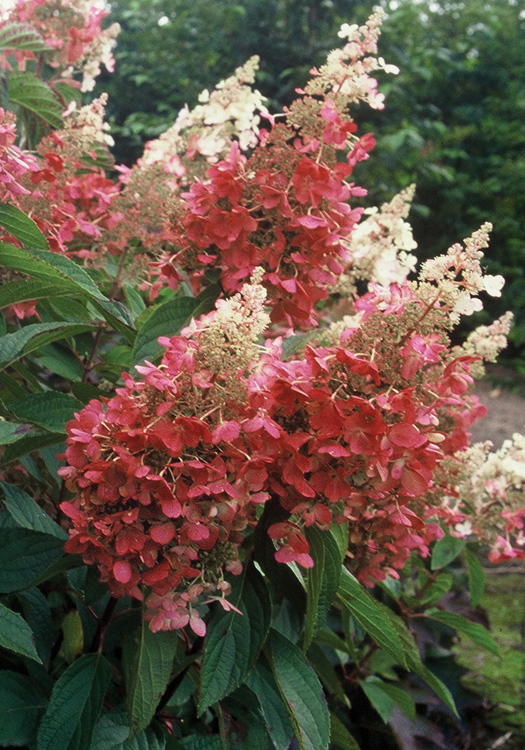 In spring a doublefile will bloom flowers resembling lacecap hydrangeas, oval red berries follow eventually turning black bringing birds to the dinner table. This is an easy plant to grow in sun or part shade and tolerating almost any soil that is well-drained and moist.